Meeting Budge Wilson was rather like meeting a long lost Canadian aunt, if only I had one. I met Budge at her London hotel during her whirlwind British publicity tour for her book Before Green Gables. Things at the hotel weren’t working out very well, so Jodie from Puffin had some complaining to do, before we were given somewhere to talk. Once the practicalities were sorted and a number of confused hotel employees had got their act together with pots of tea and endless bottles of water, we were fine. Budge looked lovely in a pink top and matching pink lipstick, which is the kind of colour co-ordinating I like. When I said that she looked just as she does in her photographs, she wondered if I’d also been able to see how short she is. To start with Budge is concerned because she’s not feeling a hundred percent well, but she perks up during the interview. The meeting-my-aunt feeling continues when Budge starts off by interviewing me, which is very sweet, and I just wish I had more important information to share. I confess that I’m worried because I know very little about Budge, but she says “it’s lovely for me”. Being so well known in Canada, and particularly so in her native Nova Scotia, she has got tired of being asked the same thing over and over again. Still feeling guilty about the insularity of the British book scene, where we tend to know far too little of even English language books from the rest of the world, I tell her that I Googled her the previous day, and was surprised to find my own review of Before Green Gables on the first page. If Budge hadn’t made a point of telling me her age, I wouldn’t have known she’ll be 81 in May. It makes the travelling to publicise a book much more impressive, and I’m amazed at her stamina. I ask whether she has been to Britain before, and Budge tells me of the trip the family made in the late sixties when the children were young, touring the length of the country in a dormobile during five weeks. She describes it as “a fate worse than death”, which I suspect was more because it was tiring, than that this country was particularly horrible. It was a “hard, hard trip and I remember very little”, she says with a rueful smile. This time, having left snow behind in Canada, Budge and her husband Alan really noticed the green fields of England as their plane came in to land. “All so tidy. I’m not used to tidy countryside. Like Prince Edward Island, with the hedgerows, like a child’s drawing.” Budge had time to study the London suburbs as the traffic crawled on their way in to central London, especially the architecture and people’s homes; “the stick-together houses” made from different materials than she’s used to. As I admit to understanding the Canadian style wooden houses, on account of them being similar to Swedish ones, Budge reminisces about a trip she once made to Finland. It “was so like Nova Scotia you wouldn’t believe it”. She feels rather guilty over placing Anne Shirley in the middle of the woods in Nova Scotia, and says if she could write the book all over again she wouldn’t. But we discuss this, as there is obviously a need for Anne to have lived somewhere very different to Prince Edward Island, which strikes Anne as paradise. It was L M Montgomery who gave Anne’s past a day trip to the seaside, and this forced Budge to give her somewhere inland to live. She spent days driving round trying to find where to place Bolingbroke and Marysville and “up the river”. 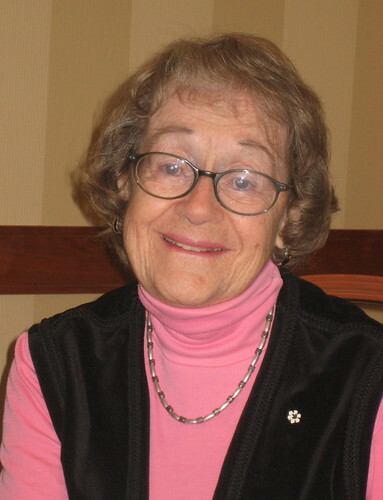 She had to settle on a fictional area after finding red soil somewhere, which meant that it wouldn’t do for Anne, who had never seen that colour soil before coming to PEI. Budge reckons Bolingbroke might have been Truro, as it fits the description given by Montgomery. “Prince Edward Island has so many Japanese in the summer, it’s surprising the island doesn’t sink”, says Budge, adding that she feels she has “short changed my province”. I suggest that she couldn’t very well write her Green Gables prequel with an eye to the tourist industry. I’d read somewhere that Budge had been reluctant to take on the task of writing about Anne’s early years when she was approached and offered the job. “I didn’t want to write it”, she says. “I said I’ll think about it. I thought about it for two months”. One reason was that Budge had another book on the go, a collection of poems for the Swiss Air disaster near Halifax ten years ago. Being two thirds of the way through this, she knew she couldn’t both finish it and write the Green Gables prequel. And “I was concerned L M Montgomery might not want me to do this”. Budge was also fully aware of the strong feelings she would incur by writing the book. There are many Canadians “whose hearts beat so strongly for Anne, they’d not want me to do this”. After she had decided to do it, Budge found that when it was announced to people, there were a few who didn’t have time to “fix their faces” on hearing about it. On the whole, though, reviews have been favourable, with only “one that did tear me to shreds”. As she approached the task, Budge found it was “a puzzle to solve, with a heroine not of my making”. Here was a girl who had suffered verbal abuse, there was physical abuse that she was seeing, drunkenness, postnatal depression, and so on. Budge had never written anything historical before, so that was another challenge. She likes to do her “research by asking human beings”. I ask if Budge knows when Anne was born, and whereas she had thought it might be in 1876, careful counting backwards from when Anne’s son Jem joins World War I, puts her year of birth as 1866. This meant Budge had to be careful and “never mention the date”, and she had to stay vague to avoid inconsistencies. Budge considered bare light bulbs for the orphanage, but was told not to “touch electricity”, which is wise advice in more ways than one. Other problem areas are clothes and how people work, where both safety pins and assembly lines needed avoiding. For those readers who remembers Anne’s puffed sleeves, it seems that L M Montgomery got that wrong, but Budge guesses she just wanted to use them, and so she did. As Budge talks about the process of getting started, she waves her arms about, indicating Penguin to the right and the Montgomery family and law firm on her left. She first had to provide sample chapters, as well as a long outline of what she would write. To her astonishment, Budge loved writing Before Green Gables. “I tend to write the first draft extremely quickly”, and she wrote a chapter a day, in 71, non-consecutive, days, finishing on her 80th birthday. Usually Budge likes to take a long time over “the lovely editing process”, sitting in her bed, with all her papers spread out, and writing by hand. This time she had a deadline to meet, so had to rush things rather more. Penguin originally wanted 300 pages and Budge’s reaction to this was that she couldn’t possibly write that much. The finished book is 465 pages, and that’s after some of the pruning Budge had to do. She tried very hard and managed to cut about 2000 words, initially. The Americans wanted her to cut another 32,000 words, but all she felt able to prune was another 4000. The scenes between Anne and Mr Thomas were some of the ones they suggested removing, but Budge stuck to her guns and kept those passages. While writing, her “saddest moment was when Anne gave the teddy to Noah”, and she muses over the fact that as the author she could have changed this, but felt she shouldn’t. Anne couldn’t have kept the teddy when she got to the orphanage anyway. I ask how much research Budge did as regards what orphanages were like. She looked into things very carefully, and found to her astonishment that whereas Canada had laws about the humane treatment of animals, the humane treatment of children came later, in the 1900s. We discuss the dead men in Anne’s life; Mr Thomas and Mr Hammond, as well as Matthew. I admit to a fondness for the Eggman, and Budge says how “very crucial” he is, and how she had to delay things in the plot to prevent it being possible for Anne to be adopted. In all, there were so many possible good outcomes for Anne, and it was heartbreaking that Budge needed to “keep” Anne for Matthew and Marilla. Something that had puzzled me when reading Budge’s book, was what age it’s intended for. Somewhere I’ve seen 8+, but whereas it’s about a young girl, that doesn’t necessarily mean it’s suited for that age group. And I wouldn’t say Budge’s style is difficult, but it’s not dumbed down, either. Budge herself feels it’s very much a book for all ages, but it seems that most readers are adults. Once Budge had finished Before Green Gables, she had a lesson in saying nothing in interviews, as the publisher wanted nothing given away too early. Budge says her blood pressure shot up, until she learnt to talk without saying very much. Unlike with me, where Budge suddenly starts worrying that she’s talking too much. She gets out a copy of my review of her book and asks me about the Ipecac. She felt it had to be included in the book, but she was so uncertain about whether it was safe, and Budge was intrigued to find I had used it. That brings us on to homeopathy in general, and then I feel it is I who talk too much. We get chatting about book covers, and Budge shows me the Canadian cover. Under the dust wrapper the Canadian edition is really very attractive, with an old style faded look. I ask how the book is selling, and in Canada it’s “selling extremely well”, and had sold out before the launch. The launch, incidentally, was held on a day with a blizzard, which caused most of her family to be late for the event, although they arrived safely in the end. Budge gets out her bag to show me. Her daughter made it specially for this trip, and although it’s not Budge’s usual colours, she really likes it. So do I. It’s a beautiful green fabric, with BGG appliquéd in orange on one side and the name Budge on the other. The handles are plaited in orange wool, and they are of course Anne’s hair. It’s the perfect Anne bag. Budge had expected the British to be so sophisticated that they wouldn’t appreciate a hand sewn bag, but everyone has liked it. I say that people here have less time to make things, and Budge has noticed how much “everyone is rushing”. Apparently a sure sign of a Nova Scotian is that they stand still on escalators. I wonder what that makes me? I ask Budge to sign my copy of her book, and I don’t think I’ve ever had anyone consider so carefully what to write. When I read it, it’s an invitation to come to Nova Scotia, and that’s definitely a first. Budge has described her home province so vividly, that I don’t think she needs to be concerned that she’s not “selling it”. Their “springs are very grim” and Budge says she never makes school visits outside town in April, because it’s “ a hideous month”. She tells me to come in September to see their “magnificent fall”. I get the impression that autumn colours are better in Nova Scotia than anywhere else. And her description of the varying seascapes near her home, almost has me on the first plane to Halifax. It’s an unkind thought, but I’m almost grateful for the migraine that cancelled Budge’s next interview, which gave us twice as long to talk. Had it not been for my train home, I may well have been there for much longer still. We find our way out, and Budge grabs the large, almost full, bottle of water, and says she’ll take it to her room. I admire someone who is sensible and thrifty. Very nice interview, Bookwitch, and I would jump at the invitation to visit Nova Scotia. It really is beautiful. I feel like jumping at these invitations. Shall I just disregard the fact that it’s term time, or shall I leave Daughter at home? We’re buried in snow here in most of Eastern Canada, so I wouldn’t be too hasty. It must be time to write in Canada. Had an email from Budge minutes ago, and now your comment. Budge already has me sitting by the sea admiring the view, and I’m wondering if October half term is too late? I just found this site today and am enthralled. I loved Before Green Gables. My eleven year old daughter, who has read all the Anne books many times, bought it back in the summer with her birthday money – I am ashamed to admit that I was a little dubious about the idea of a prequel myself. How could I have been so wrong. The level of attention to detail makes it so satisfying to read and it is so very moving. It must have been a daunting task to take on, but Ms Wilson did it so well. My daughter and I thank her for giving us so much pleasure. We have all doubted the wisdom of a prequel, but most of us loved it. Though one of my best friends was appalled. But you can’t win them all. I am almost finished reading BGG and I am just as enthralled with it as I was the first book of Anne. What a writer; she captured Anne exactly as she would have been. Her spirit is so perfect, and the descriptions of her reactions to life could not have been done better. Thank you Ms. Wilson. I am so in love with Anne and Canada. My husband happened across it at Walmart while we were Christmas shopping. I had no idea it had even been written. It is my favorite Christmas gift.. Finished with BGG and So inspiared by annes tough story and how she got to the island. Mom and I were looking the library for my little girls and they loved it too. Thank you for such a warm, realistic account of your interview with this very dear author. We were in PEI for a vacation the year after the 100th anniversary and I grabbed the book and read it with delight while lounging at a cottage near Souris, PEI. Mrs. Wilson brings an unmistakeable blending of two excellent traits: creativity and seasoned scholarship. Thanks, JoAnn, but it was all Budge’s own doing. She’s just so friendly and normal.